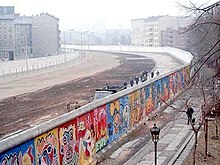 The Berlin Waw (German: Berliner Mauer) separatit the ceety o Berlin in Germany frae 1961 tae 1989. It separatit the eastren hauf frae the wastren hauf. Mony fowk thocht it wis a seembol o the Cauld War. The Berlin Waw wis taen doun on 9 November 1989. The Berlin Waw wis aboot 168 km (104 mile) lang. It wis biggit tae stap fowk frae escapin frae the eastren hauf o Berlin. Efter Germany split intae Wast an East Germany in 1949, 2.6 million East Germans left tae gang tae Wast Germany. In Berlin alane, 1.6 million fowk flit tae the wast. Tae stap this, on 13 August 1961, the Communist govrenment o East Germany biggit a waw separatin East an Wast Berlin. In the late 1980s, Mikhail Gorbachev said that the Soviet Union wouldna uise the Reid Airmy tae stap the fowk o Eastern an Middle Europe frae chyngin thair govrenment. Efter he said that, several kintras began tae chynge the wey thay governit thair fowk. Hungary openit its mairch an fowk frae East Germany began muivin tae the wast throu Hungary. In Juin 1987, Preses o the Unitit States, Ronald Reagan spoke at the waw tae challengit Gorbachev tae "Tear doun this waw!". In October 1989, mass demonstrations agin the govrenment in East Germany began. The lang-time leader, Erich Honecker, resignit an wis replacit bi Egon Krenz a few days later. Honecker haed predictit in Januar 1989 that the waw wad staund for a "hunner mair year" gif the condeetions whilk haed causit its construction didnae cheenge. This didna turn oot tae be true. In November, 1989, the Central Committee o East Germany decidit tae mak it easier for East Germans tae pass throu the waw. A mistak bi the press officer meant the mairch wis openit several oors afore it should hae been. Millions o East German ceetizens celebratit the openin o the waw. Mony collectit souvenirs wi chisels an some televeesion stations filmit fowk hittin the waw wi sledge hammers. 2 Tear doun this waw! In the 28 year o its existence, atween 125 an 206 fowk wis killit whan ettlin at crossin the Berlin Waw. At least 800 mair fowk wis killit ootwi Berlin, tryin tae ettlin at crossin frae East Germany tae the wast. The last fowk killit at the waw wis on 6 Februar, 1989, whan Chris Gueffroy dee'd ettlin at escapin intae Wast Berlin. "Tear doun this waw!" wis a speech made bi Preses o the Unitit States Ronald Reagan tae Soviet Union leader Mikhail Gorbachev tae malafouster the waw. The speech wis made at the Brandenburg Gate near the Berlin Waw on 12 Juin 1987. It wis made tae honour the 750t anniversary o Berlin. His speech wad eventually lead tae the waw's demolition. Contact wire fence wi barbed wire fence. Heicher than a man. (No in aa places) Kennels for dugs. Wi German Shepherd Dogs or ither trainit dogs. (No in aa places) Equipment an trenches tae stap vehicles an tanks. Thir seestems wad be removit (gif the West peyed for the remuival). Maist war replacit later. Streets tae get replacements an reinforcements in. death strip. This wis an aurie in whilk aw o the buildins wis torn doun, wi nae place tae hide. Whiles, thare wis strips o saund whaur fitprints coud be detectit. Concrete waw, 3.75 metres in height. Very haurd tae climb. A pairt o the Berlin Waw, that is left thir days. In mony places, the Waw wis replacit bi pavin stanes lik thir anes. Commemorative plates include this ane sayin Berlin Waw 1961-1989. Efter the Reunification o Germany in October 3, 1990, the Berlin Waw wis demolishit an takken awa. A few sections o the wa remain; some o the sections became a museum. O the tot o 302 watchtouers, 5 is left. The sae-cried Todesstreifen (daith zone) can still be seen in mony places. Some o them is lairge auries o broun, uncultivate land. Whiles thay are nou parks. Thare is a private museum at Checkpoint Charlie. Thare is a cemetery near Checkpoint Charlie, myndin the victims o the Waw. ↑ The exact nummer isna kent. It is haurd tae say as the authorities o the GDR didna report the daiths clear. ↑ "Reagan's 'tear down this wall' speech turns 20 - USATODAY.com". USA Today. June 12, 2007. Retrieved 2008-02-19. Wikimedia Commons haes media relatit tae Berlin Wall. This page wis last eeditit on 9 Juin 2018, at 05:53.